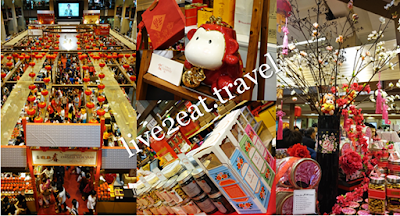 With Chinese New Year (CNY) round the corner, have you bought festive goodies and new clothes? While I would not be able to help you on the latter, could share on the former. I went not once, not twice or even thrice but four times to Takashimaya's CNY Festive Celebrations. There seemed to be fewer stalls selling nuts, baked and fried goods. Instead, there were more dried goods and frozen seafood stalls with even SK Jewellery jumping on the bandwagon. What stood out this year was many stalls were baking pineapple tarts on the spot, so the place was filled with the aroma of butter and sweet pineapple. I ordered the ones from SunnyHills, and kueh lapis from Bengawan Solo. As Kee Wah Bakery did not bring in its Chinese sweet crispies, I bought its pineapple shortcakes and almond crisps which I fell in love with after someone bought and brought it back from Hong Kong as souvenir. Another 1st time participant is HarriAnns, a family-run business that started more than half a century ago peddling from a pushcart on the streets in Tiong Bahru and subsequently relocated to Tiong Bahru market. Known for its handmade nonya kuehs especially ondeh-ondeh, it has been passed down three generations and can still be found at Tiong Bahru market (no GST If you buy from here). It also has a stand-alone concept café albeit non-air-conditioned on the 1st floor of Bugis Junction, tucked away at a corner outside BHG departmental store – HarriAnns Nonya Table. Bought its cashew cookies and kueh bangkit that had a lovely aroma and melt-in-the-mouth texture, both presented together in a lovely tall box printed to resemble tiffin.